And this allmighty Leone doesn't have any savate shoes and dresses and other savate special training equipment. ELKAAMOUCHI Abdelkader (France) Vs Studenikov Andrey (Russia) Sankt Petersburg (Russia) 27th of November 2010. Beautiful fight and beautiful ring girls. But Andrey should protect his right knee more. Shin kicks to the knee when you are not allowed to make block with a leg is a perfect attack in french boxing that judges don't sanction as they should. Is kicking to the knee secret and future french boxing weapon or we should change that kind of "sportive" behaviour. In sport like french boxing we should protect fighter against powerful low kicks to the knee. Do you remember how many super savate fighters damaged their knees during their fights - Sylla...? I would allow knee kick only in savate pro. At the end of the video you can see new aproaches to stick fighting (similar to Chanbara). AIBA still protects its member Boxing federation of Slovenia. This small boxing national federation nominated professional boxer Dejan Zavec to Olympic Committee of Slovenia as a top sportsman and his result achieved in a professional ring in IBF professional boxing federation as an amateur achievement equal to olympic ones. Slovenian Olympic Comittee accepted this nomination and Dejan Zavec is promoted by Ministry of Sport as one of the best sportsman from Slovenia as a part of Olympic movement. All Slovenian media houses were forced to report the only truth - we have World boxing championship. Naturally out of AIBA amateur system, which is recognised by IOC and Sportaccord. IBF is also not WADA recognised. I ask myself if AIBA silence is really good for an amateur boxing? Is it good silent of IOC? Is it the correct way of Sportaccord to allow that kind of behaviour? forward 2:55 - AND YOU WILL FIND THE OLDEST "COLOURed" SAVATE TRAINING. Remember 1968. 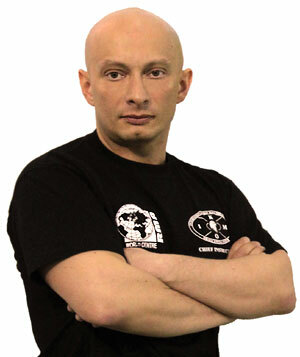 President of savate federation Russia - Sergey Bulanov, Sankt Peterburg lost in the finals of boxe francaise combat? Le "gars Chaudron", comme il se décrit lui-même, est devenu samedi 20 novembre au soir, le champion d’Europe de boxe française dans la catégorie des lourds. Fabrice Aurieng a battu par KO le Russe Sergey Bulano dès la deuxième reprise. "Le gars la fait un l’erreur, lu l’a tape à moin quand moin lé à terre. Faut pas oublier où ça mi sorte, moin un marmaille chaudron, moin n’a le coeur. Lu l’a fait lève mon gros cœur et lu l’a paye les conséquences". En trois phrases de créole, Fabrice Aurieng résume son combat de samedi soir contre le Russe Sergey Bulano. Il devient champion d’Europe de la catégorie des lourds (+ de 85 kg). Le "gars Chaudron" a mis son adversaire KO dès la deuxième reprise, alors qu’un combat de boxe française en compte cinq, de deux minutes chacune. 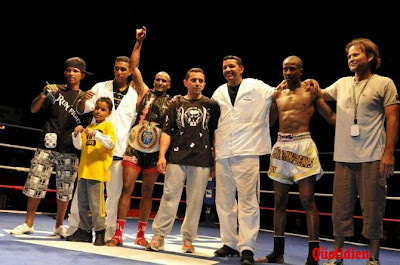 Le nouveau champion s’est envolé pour d’autres combats en métropole dimanche 21 novembre, mais assure qu’il reviendra bientôt : "m’a essaye fait la Fête Caf ec zot la Réunion"
Will kickboxing (boxe americaine) eat its own biggest supporter BOXING (english) ??? Formally established in Tokyo (Japan) 5 December 2009 at the initiative of Swiss national, Carl Emery, the Pantheon of Sports and Martial Arts has development of sports and martial arts in the spirit of chivalry, directly inspired by the Olympic movement and code of honour of the martial arts in general and, in particular, that of Bushido. The Pantheon is a non-profit organisation with headquarters in Geneva (Switzerland). The Pantheon and its various committees are actively involved in promoting sports and martial arts, defending ethics and fair play, particularly by implementing the various regulations under the Code of Conduct and Ethics for the Arts Martial drafted in Geneva (Switzerland) 3 May 1995. The composition of the Executive Committee and various committees will be announced at the next general assembly of the Pantheon to be held 20 September 2010 in Las Vegas (USA). Active departments of the Pantheon on 1 January 2010 are the Executive Council, the General Secretariat, the Committee of events analysis and sports results, the Committee for nominating candidates to the Pantheon, the Charities Commission, the Commission for Sport for All, the World Kickboxing Forum. Executive Council: executive management of the Pantheon of Sports and Martial Arts and monitoring the functioning of its various bodies. Nomination of candidates proposed by the ad hoc committees. General Secretariat : general administration, accounting and fundraising, coordination between the Committees and the Executive Council. Public Relations. Logistics. Committee of events analysis and sports results: upon mandate, inspection of sporting events, results, organisations, structures, curriculum vitae. Report writing and delivery of quality standards “label”, upon request. Dissemination of databases and content of reports made to the media or any other public or agencies. Committee for nominating candidates to the Pantheon: study of applications received or proposed. Research on candidates and hearings. The Charities Commission: financial support and/ or logistical for private or public initiatives relevant to combat sports and martial arts. Financial support, equipment for athletes or clubs. Commission for Sport for All: organisation of events or supporting Sport for All themed events, in close collaboration with TAFISA, UNICEF, WHO and UNESCO, among others. INTERVIEW with the founder of the WORLD KICKBOXING FORUM which will be held in GENEVA, Switzerland – November 20 . Fightmag.net : Historical meeting . How many federation have signed up so far , less than 2 weeks left before the FORUM ? Carl EMERY : Fifteen international federations have confirmed their participation so far. The main federations will take part. This is the first time in the history of kickboxing that all the World sanctioning bodies will sit around the same table. I agree with you this will be a historical event and I am really proud of the tremendous work that my team of the Pantheon of Sports and Martial Arts have done to bring all these people together. Believe me! It has not been a pleasure cruise! I would like to congratulate all the presidents of the different federations who have accepted to take part in this forum. In doing so, they have shown their good will and their determination of making kickboxing become a stronger and more credible sport. Fightmag.net : Who can join and participate in FORUM ? Any restrictions ? Carl EMERY : Absolutely no restriction. All executives (presidents, directors) of all kickboxing sanctioning bodies that are internationally represented can take part. The size of the organization does not matter. This was the only way to bring all organizations together. I perfectly know that some of the organizations that are taking part to the forum are very small and are not very active. We have to welcome them though. We do not want to segregate anyone. Fightmag.net : How the idea of the FORUM was created and when have you started organizing it ? Carl EMERY : When I was competing. There were only 2 Worldwide federations. And I even thought it was stupid to have 2 world champions, for the same sport, in the same weight divisions. Today it has become easier to be World champion than National champion in many countries. This is simply ridiculous. We are killing the sport like federations and managers have killed boxing. I thought that we had to do something. Fightmag.net : What will be the major topics to discuss ? Carl EMERY : I especially have chosen very reachable goals for this first forum. It has to be successful. First of all, we will decide for a common medical form for the competitors. Of course, some countries already ask higher requirements for their competitors and we will encourage them to continue. But in some other countries, there is nothing at all and this can endanger the health of the fighters. We will discuss about creating a website with World data of the results and records of kickboxing matches. Fightmag.net : Any will of finding a conclusion of uniting “ All under ONE “ ? Carl EMERY : Of course, this is my dream! I hope that it will come true one day but I am perfectly aware that it will take time, but a thousand miles journey starts with a small step. And this is what will happen in Geneva on November 20th 2010! Fightmag.net : Most of federations carry Thai Boxing / Muaythai , MMA under their umbrellas . Will the attention fall on these types of fighting sport ? Carl EMERY : Do you read in my mind? This is exactly what I will announce at the end of this first World Kickboxing Forum. The next forum will certainly be called World Combat Sports Forum and will include Muaythai and MMA. Fightmag.net : Towards OLYMPICS . It is being discussed and hear-said for many years the facility of joining the Olympic program with Kickboxing . Will be any commissioners from the OLYMPIC head structure presented on the FORUM to assist ? Carl EMERY : All I can tell you is that the contacts I have in the highest spheres of international sports organizations are very pleased that this forum will finally be held. They have a lot of hopes that this initiative to bring people together will continue and will be fruitful. Kickboxing has NO chance to become an Olympic sport if the main organizations do not find a way to merge. This is not a supposition. This is a fact. Fightmag.net : Thank you . Carl EMERY : Thank you for your interest. I will keep you and your readers informed! Instructor of : aerobics, cardio kickboxing, muaythaï, kickboxing, self-defense, police defensive tactics, tactical shooting, ju-jitsu, mixed martial arts. Amateur sports: Boxing, judo, ju-jitsu, mixed martial arts, more than 50 tournaments and titles won from 1987 to 2004. - Teams and federations medical advisor for prevention and fight against doping. - Member of the Committee of the Swiss french part Sports Medicine network. 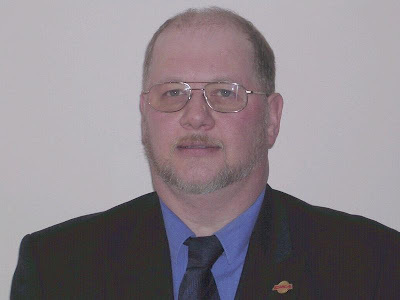 This Inaugural meeting of all World Sanctioning Bodies was spearheaded by Carl Emery from Switzerland a former World Full-Contact Kickboxing champion. It happened - the World of Kickboxing came together on this day 29th Novemember in Geneva Switzerland at the hotel de la Vendée. This is the first time that all world kickboxing sanction bodies agreed to sit together for the good of the sport as personal differences where left outside. This Inaugural meeting of all World Sanctioning Bodies was spearheaded by Carl Emery from Switzerland a former World Full-Contact champion. Mr Emery also created the Pantheon of sports and martial arts group. ISKA, IKF, ITB, WAKO, WFK, WKA, WKF, WKN, WMAG, WPKA, WPMF, WTKA, WUFC and more took part. Modibo Diarra is leaving the French boxing (savate) after a title of Europe champion of light welterweight won Sunday in Châtellerault. The Malian born French citizen defeated the Italian Umberto Musso. It was his second European title. 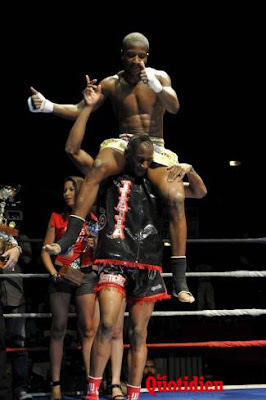 Nevertheless, Diarra (25 years) twice World champion (2007 and 2009) has decided to leave the French boxing for Muay Thai (?). A topic to be continued. On a hunt for savate in Italy. Where is our litle Italian hero - boxe francese and canne de combate? 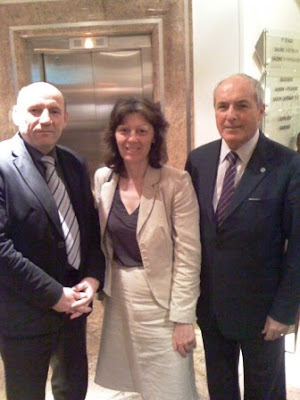 Gilles Le Duigou (left) , Julie Gabriel (middle), Ennio Falsoni (right). 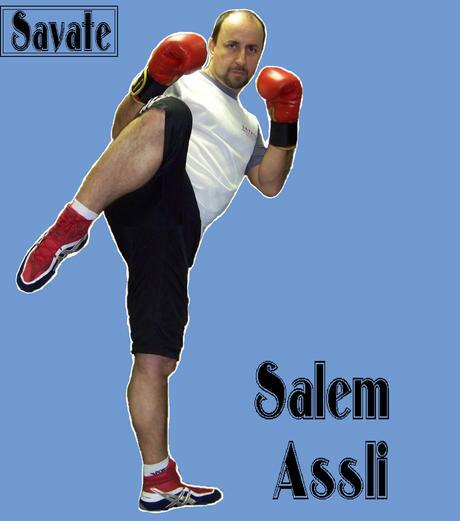 Was FIST the only one lover of savate in Italy all these years? FIST was part of a federation called CISCO in 2003!!! FIST organised savate national championships in 2007!!!!!! These days in Lausanne, Switzerland president of WAKO - World association of kickboxing organisation and FIKB - Federazione Italiana Kickboxing Ennio Falsone and new and old president of FISav - International Savate Federation - Julie Gabriel and Gilles Le Duigou try to discover if italian savate is part of italian kickboxing or not. In Lausanne all three representatives talked about FIST - Federazione Italiana Savate and Thaiboxing and its membership in FIKB - Federazione Italiana Kickboxing. Falsone - president FIKB talked about FIST membership in FIKB from 2004 to 2007. And that FIKB invested a lot of money and time in FIST. Italian savate? Where it is in its pure form? It is a weird story because Italian kickboxing grew up from savate and now savate as father should be child of its own child. 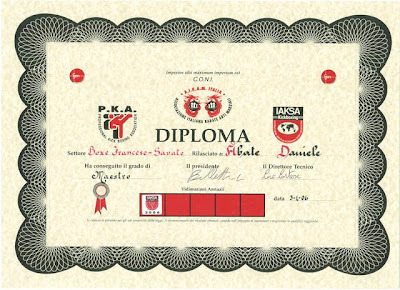 Stories about FIST and other savate federations in Italy through all these years tell us that there is no savate continuation through one savate federation. Savate existed in those wonderland called Italy in at least 4 or 5 organisation at the same time in the last 40 years. 10/12/1991 Guanto Giallo di Boxe Francese Savate – U.I.B.F.S. 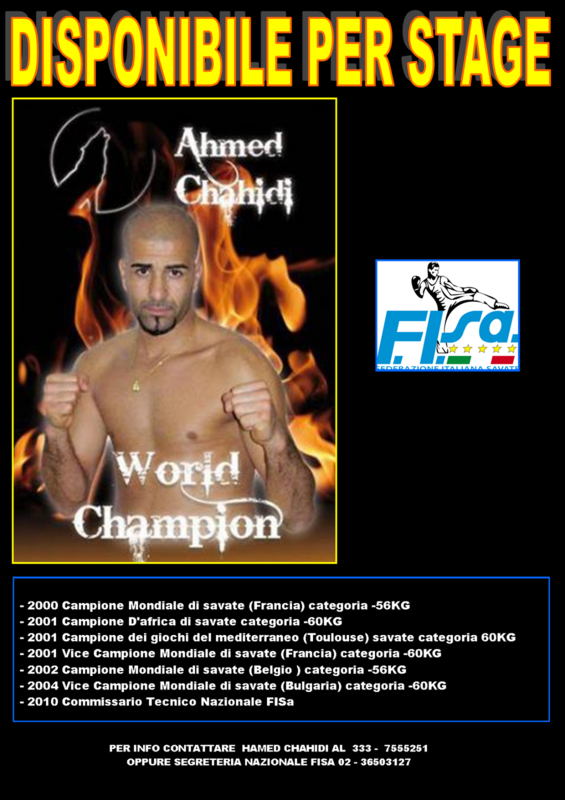 10/12/1991 Istruttore di Boxe Francese Savate – U.I.B.F.S. 22/01/1994 Allenatore di Thai Boxe – FE.NA.S.CO. 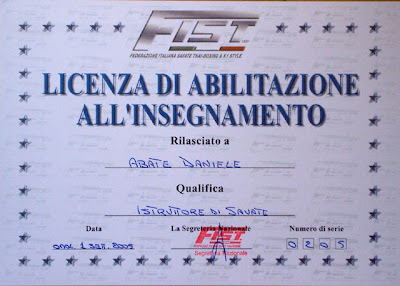 17/02/1996 Istruttore di KickBoxing – FE.NA.S.CO. 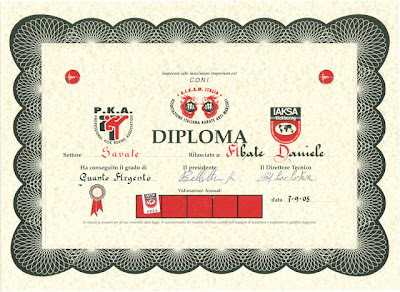 04/07/1997 Cintura Nera 2° DAN di KickBoxing – FE.NA.S.CO. 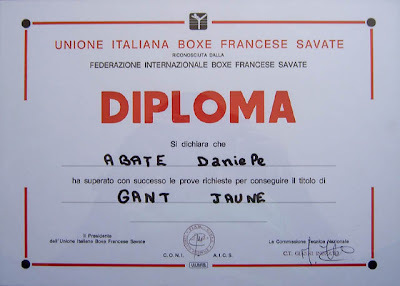 07/09/2005 Guanto d’Argento di Boxe Francese Savate – I.A.K.S.A. 03/02/2006 Cintura Nera 3° DAN di Japanese Kickboxing - I.A.K.S.A. 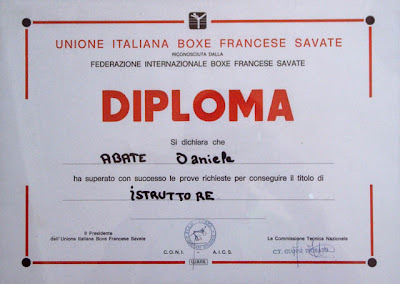 03/04/2006 Maestro di Boxe Francese Savate - I.A.K.S.A. Maggio 2008 Cintura Nera 5° DAN in Japanese Kickboxing – I.A.K.S.A. 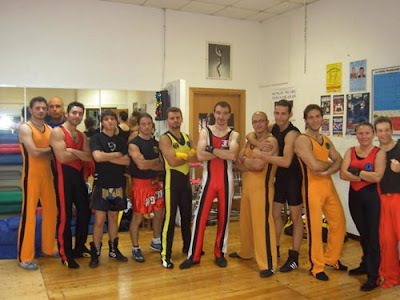 Luglio 2008 Maestro di KickBoxing e Thai Boxe – C.S.E.N. 01/10/2009 Guanto d’Argento di Boxe Francese Savate – F.I.K.B. 01/10/2009 Maestro di Boxe Francese Savate – F.I.K.B. 01/10/2009 Cintura Nera 4° Dan di KickBoxing (LOW KICK e K-1 RULES) – F.I.K.B. 01/10/2009 Maestro di KickBoxing (LOW KICK e K-1 RULES) – F.I.K.B. Modibo Diarra (Team Albert) vs. Italian hero. Wu shu and savate ex Technical director. President of Modibo's savate club. AIBA and IOC will react. Trust me. Dejan Zavec - IBF world champion - was categorized by slovenian Minister of Sport Igor Luksic and president of Slovenian Olympic Committee Janez Kocjancic as an amateur sportsman in AIBA member Boxing federation of Slovenia. As a professional boxer he is not a member of AIBA, and also Ministry of sport of Slovenia recognise in boxing just amateur results of AIBA boxing international amateur federation. What actually happens in this small EU country of Slovenia? Welcome to Slovenia Don King, welcome all loosers from professional sport boxing. You will enjoy the money of Slovenian tax payers although Slovenian amateur boxing is amlmost dead. Bu don't worry you can ask for Slovenian money also with a foreign club like Dejan Zavec did. Probably through german club where he trained some time. ALI G - please let's say again - go back to Slovenia. Dejan Zavec is also a pesident of Slovenian professional boxing federation. And this federation is not a member of AIBA - WSB. This is very nasty move, and dissapearing of website of Slovenian amateur boxing federation talks for itself. Poor German boxing against Mexican pride. This time German cookery went to far. World series of boxing in Milan. Milano Thunder (ITALY) vs. Paris United (FRANCE). Who knows for Salem Asli these days in FISav? Did somebody saw him in the past ten years in savate competitions? But his podcasts talk positively about savate and its development, so he makes good thing to savate as sport. Please listen. 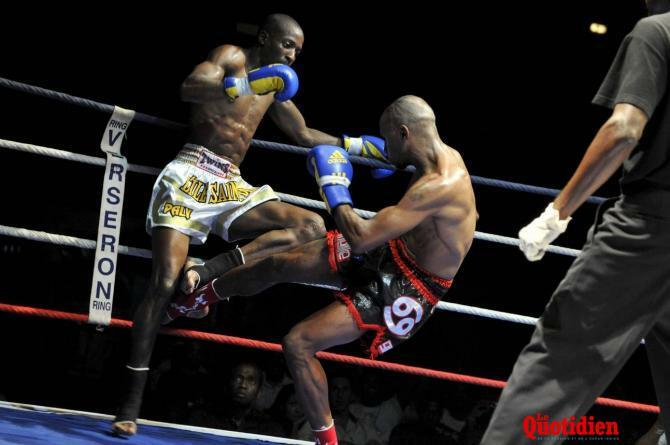 WAKO PRO Jianny Alamelle Vs Paly Dembele Fight For Peace. New savate champion succeded in WAKO PRO. Who says there is no cooperation beetwen WAKO and FISav? "Rich" fighters CV. With Nathalie Barillot (also top savate fighter) he is a proud daddy and of course one of future savate trainers in France. Watch his exelent moves. European combat savate championship - Finals - Parc des sports du grand Nancy/Vandoeuvre 6th of November 2010 with fights of France Elite combat national french championship. Stage with ex president FIS Gilles Le Duigou in Genoa 27th of February 2010 in A.S.D. ECOLE DE SAVATE ET CHAUSSON DE RUE, Imperia. 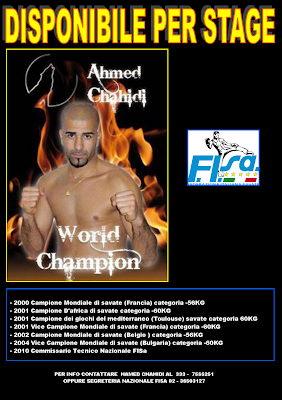 Savate Champion - Italy - Combat - Luigi Alessandri A.S.D. Ecole de Savate et Chausson de Rue. AIBA Boxing - WSB : World Series of Boxing, and Brahim Asloum - Paris United team. Croatian boxers also compete for this team. Forbbiden in a sport savate - boxe francaise. Many judges tolerate this kickboxing kicks in boxe francaise competitions. Why? Probably they are not trained enough or they simply don't differ sport savate from kickboxing. How to train pendulum kicks? On the opening day of its Congress at the Rixos Hotel today, the International Boxing Association (AIBA), the world governing body for the sport of boxing recognized by the International Olympic Committee, announced a relocation of its planned international boxing academy to the host city of the Congress, Almaty. The AIBA Academy was first presented to the AIBA Congress on October 22, 2007 in Chicago, USA as a special development vehicle to promote the sport of boxing and offer development opportunities to all stakeholders in the sport in one place. The aim of the AIBA Academy is to offer development and training programs along with education programs to help boxers with their post-boxing careers. It will also offer sport management courses for boxers, coaches, referees and judges and administrative personnel of national governing bodies. On August 18, 2008 in Beijing, China, the AIBA Executive Committee had selected the city of Bécancour in Canada as a site for the AIBA Boxing Academy. Since this announcement, AIBA started several projects under the umbrella of the AIBA Academy in Bécancour with the partnership of the University of Québec, in Trois-Rivières, including development of the AIBA Referee and Judge Manual, a referee and judge instructor course and the development of the first part of the AIBA Coaches Manual. The construction project for the Academy has since experienced delays due to a lack of financial support from the Canadian government. AIBA therefore decided to move its Boxing Academy to another location, the city of Almaty in Kazakhstan. The Kazakhstan Boxing Federation showed great interest in hosting this Academy and has been supported by the Kazakhstan government, which has approved a total of US$ 33 million in funding for the project. AIBA is preparing the host city agreement to be signed with Kazakhstan Boxing Federation and the City of Almaty. Until the new building is completed, AIBA plans to implement training programs for its new scoring system, for all "Road to London" selected boxers, as well as for referees, judges and coaches. These programs will be held from March 2011 until July 2012, with the new Academy building scheduled to open in July 2012. New Croatian president of Kickboxing federation Croatia? The most misterious kickboxing national federation in the world in a very tricky situation? Not at all. They play new tragedy about electing new president - young and charming Boris Martinovic. What you need to fight in savate? Technical skills? Savate technical regulations? Knowledge about allowed techniques? tactical skills? You have to borrow from your uncle older integral dress (to proove that you do savate) and from you friend wrestling shoes or your running sport shoes. I like also integral dress, but I like savate more, so I changed this fashionable clothes for two part dress (trousers and upper shirt) like French savate team. And why countries like Serbia, Russia and Croatia force integral dresses? And why they always choose some weird lenghth of their dresses? Is this because they like to train in shorter dresses? And do they really need hardened savate shoes for fouette - kicks with the toe? 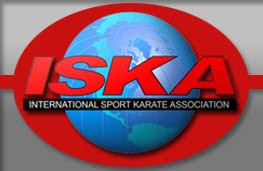 By majority vote of the ISKA European Executive Council, Fritz Exenberger is dismissed as European President and Executive Council member. “This action is necessary and overdue,” said Council Member, European Vice President and Director of ISKA Turkey, Davut Sidal. • Additional failures to carry out the general responsibilities and intent of the positions of authority. Since the all decision-making authority rests entirely with the European Executive Council, Mr. Exenberger’s removal will have no immediate impact on the administration of our European operation. Questions or concerns regarding event sanctioning may be forwarded to one or all of the following during this transition.